Accommodation and charter packages available. We specialize in tailoring packages that fit your needs. Bay of Quinte Charters is owned and operated by West Lake Willows Resort and its sister property Picton Harbour Inn. We offer fully guided walleye charters on the famous Bay of Quinte. Our captains will work hard to make your time on the water an exciting and memorable experience. Walleye - During May and early June, we offer Walleye Charters on the Bay of Quinte. During this time we are primarily fishing for resident walleye that average between 2-5lbs. 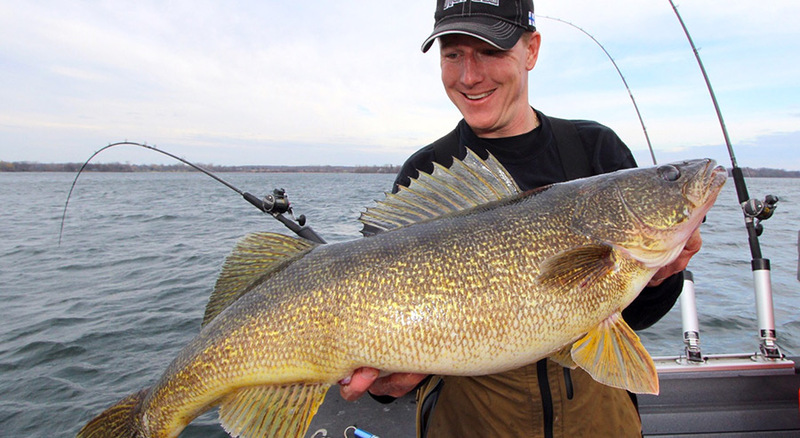 Walleye as large as 10 lbs are caught, although not common. During this time we operate out of Picton Harbour and fish the areas of Long Reach, Hay Bay, Sherman's Point, Thompson's point, Picton Bay, Mallory Bay, Big Bay, and the narrows. During the Summer and early Fall, we are unfortunately too busy with the accommodation businesses to run charters. Once mid October rolls around, we offer Trophy Walleye Charters targeting the big mature trophy walleye that migrate into the Bay of Quinte. These walleye average around 8lbs but walleye between 10-12 lbs are frequent with fish over 13lbs a very real possibility. The Fall months are about trophy fish and not numbers. You are unlikely to catch a lot of fish but the ones you get will be trophies. During this time, the walleye are migrating into the Bay of Quinte through Adolphus Reach, which is east of the Glenora Ferry. Working out of Picton Harbour and during the early part of the migration, we target these fish in the Adolphus Reach area (near Prinyers Cove) in what is known as the bat cave, and Keith's Shoal. As the water temperature drops, the trophy walleye continue to migrate into the Bay of Quinte and we then start to target fish in the waters in and around Picton Bay, Long Reach, Thompson's Point, Sherman's Point, Hay Bay, and the Narrows. We look forward to spending a day on the water with you.